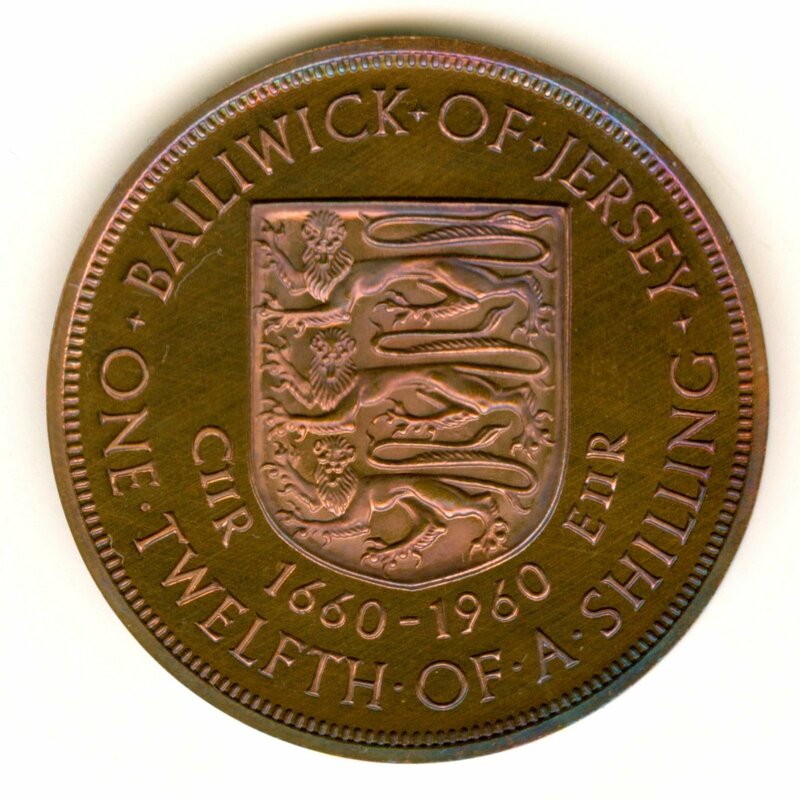 Although one twenty fourth of a shilling coins were not minted during Queen Elizabeth's reign, Jersey issued various coins including two new denominations: a one fourth of a shilling and a five shillings crown. During this time, three commemorative one twelfth of a shilling coins were also struck. These were the Island Liberation issue, the 300th Anniversary of Accession of King Charles II issue, and the 900th Anniversary of the Norman Conquest commemorative issue. Two other denominations were also struck for this occasion: a five shillings coin and a one fourth of a shilling coin. 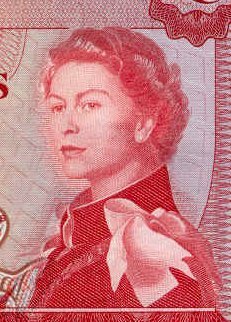 The obverse depicts Cecil Thomas' famous crowned portrait of the H.M. Queen Elizabeth II. This design also appears on the coins from Belize, Bermuda, British Eastern Caribbean Territories, British Honduras, British West Africa, Cyprus, East Africa, Fiji, Ghana, Hong Kong, Jamaica, Malaya and British Borneo, Mauritius, Nigeria, and Seychelles. 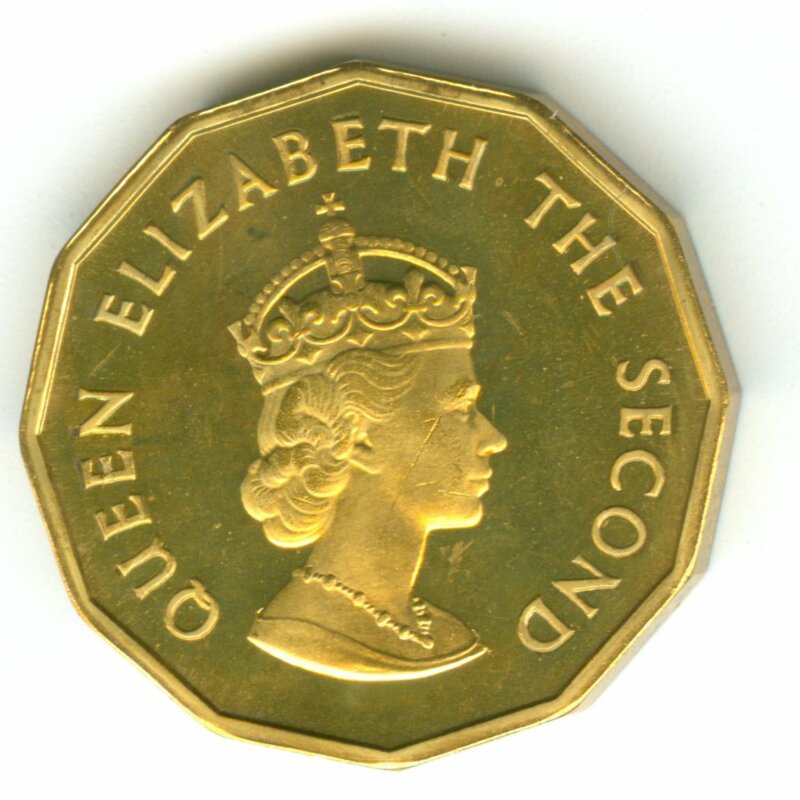 The obverse has a simple legend of “QUEEN ELIZABETH THE SECOND.” The reverse of each coin is a slight modification of Kruger-Gray's shield design. The amount of coins minted during the Queen's reign surpassed the amount minted for all the other entire monarchs combined. Proof sets were minted for collectors in 1957, 1960, 1964, and 1966.
and can be found on the banknotes issued during the 1960s. 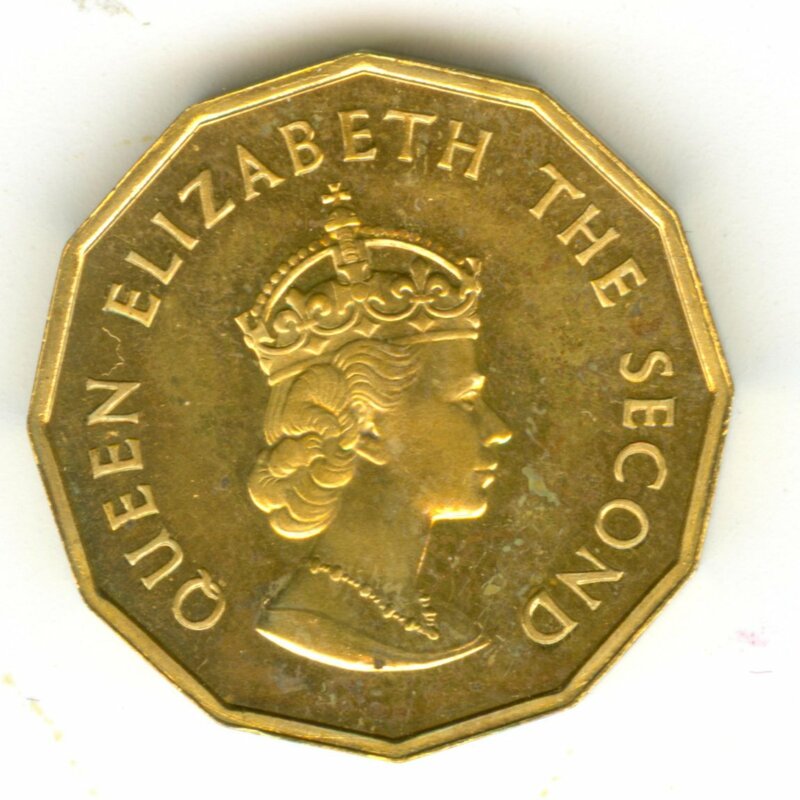 For the first coins depicting the new Queen, it was decided to continue using the same reverse as the previous coinage. The obverse legend is centered along the bottom. The Coinage Act of 1951 and the Coinage Act of 1953 authorized this coinage. This issue was minted in 1954. Although the Coinage Act of 1953 authorized the issue of one twenty-fourth of a shilling coins, none were minted. For a companion medallion, take a look at this Jersey liberation medal. Proofs exist for this coin. Although dated 1945, the coins were minted in 1954. Although the Coinage Act of 1953 authorized the issue of one twenty-fourth of a shilling coins, none were minted due to inflation. This modified effigy design was intended solely for use in Jersey. The colonial territories using the crowned effigy continued to use the standard design. The Coinage Act of 1956 authorized the 1957 issue. The Coinage Act of 1964 authorized the 1964 issue. After the execution of Charles I in 1649, Jersey was the first place to proclaim his son King Charles II. (It was not until the end of the English Civil War in 1660, that he was actually crowned king in England.) On November 28, 1663, King Charles II presented to the Bailiff of Jersey the Royal Mace in gratitude for the loyalty and kindness he received during his two stays on the Island during the Civil War. The Royal Mace is considered by many as one of the finest maces of the 17th century. It consists of 11 pieces and is made of silver gilt. The mace is 4' 9.5" long and weighs over 237 ounces (14 pounds, 13 ounces). This coin commemorates his stay in Jersey. The Coinage Act of 1961 authorized this coinage. In 1961 1,200 proof coins were made. A first order of 800 coins was completed by the end of February, while a second order of 400 coins was completed late in September. In 1962 1,000 proof coins were made. In 1963 1,400 proof coins were made. The total mintage for the proof coins is 3,6001. Krause has reported mintage of 4,200 for this proof issue, and is incorrect. These coins were produced when the Royal Mint accidentally used a wrong obverse die when minting the 1960 proof sets. At first glance, the incorrect die appears to be the one used on the 1945 Liberation issue. However, the Royal Mint destroyed these dies when the new design was introduced in 1957. The incorrect die is a British Caribbean Territories two cents die. The British Caribbean Territories two cents coin was the only coin of the same size, weight and alloy of the Jersey penny and incidentally had the inscription below the effigy. 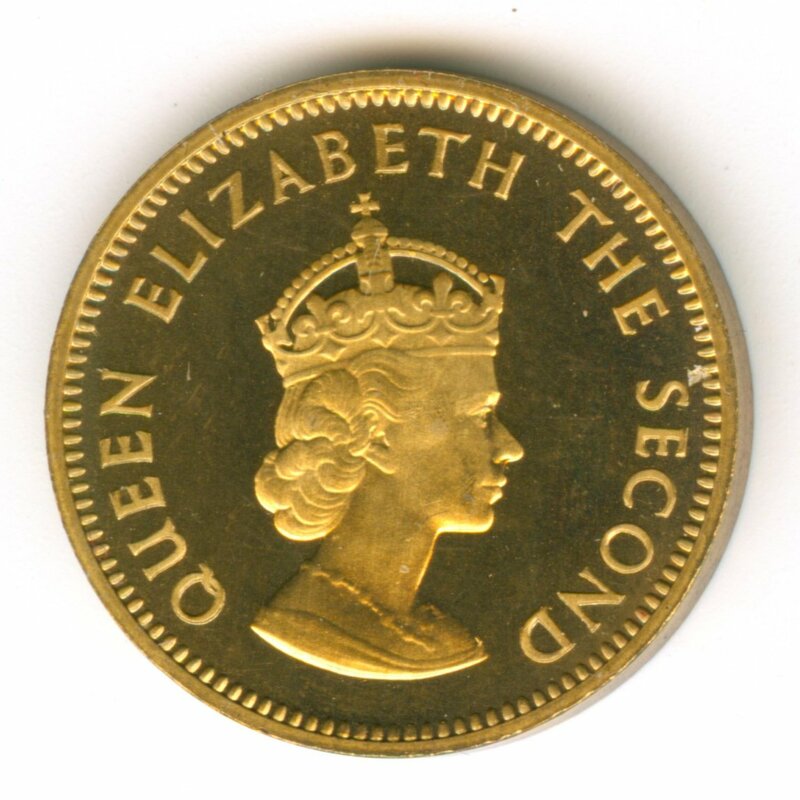 Although proof specimens of the British Caribbean Territories two cents coin and the Jersey penny were struck at the Royal Mint in each of the years 1961, 1962, and 1963, there was only one time, viz. 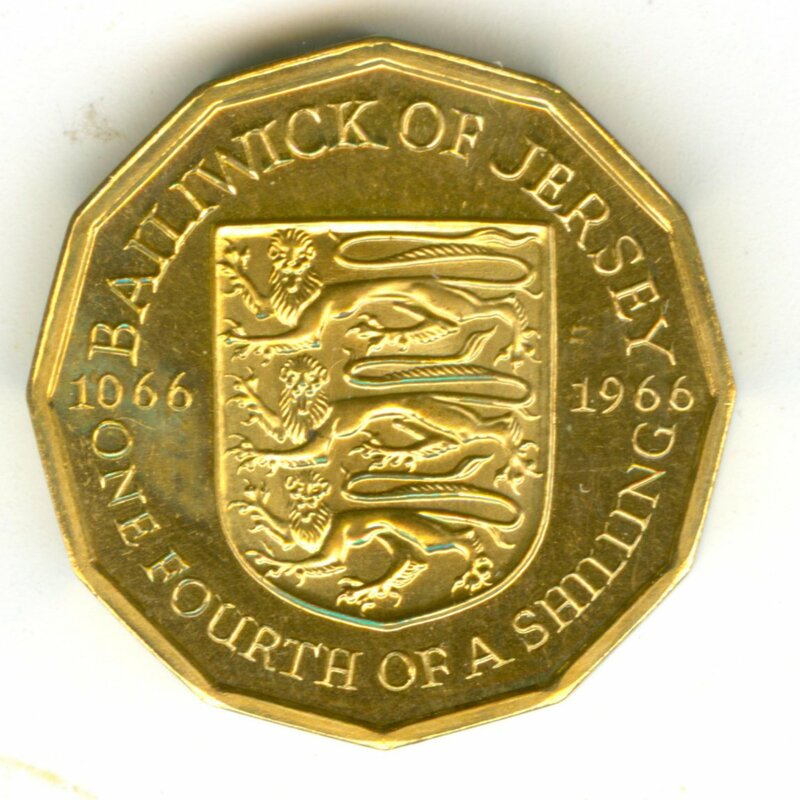 from August the 8th through the 22nd, 1961 when obverse dies of both coins were held in the coin processing room die store.1 Evidently it was during this time period when the Royal Mint manufactured eighteen two cents proof coins for the Mint Museum, which this die was inadvertently used for the Jersey coins. As for the number of coins produce, an exact number is impossible to determine. However, it would be reasonable to assume that some coins were produced after August 22 and until late September when the order was completed. Also, we can assume that some coins were produced before August 8 and that striking continued concurrently with the striking of the Caribbean two cents coins. These mule coins are a tiny sub-set of the total mintage and thus, this coin is a modern rarity. In 1966, Jersey celebrated the 900th anniversary of the Norman Conquest and its unique links with England. The Island has “peculiar” privileges obtained through a series of royal charters which has resulted in Jersey being officially known in the constitutional terms as “A Peculiar of the Crown.” In 1204, King John lost his lands in Normandy to the French but, Jersey and the other Channel Islands, which were also part of the Duchy of Normandy, sided with the King and Jersey has remained predominantly royalist since that time. These coins were minted to mark this special anniversary. The Coinage Act of 1966 authorized this coinage. 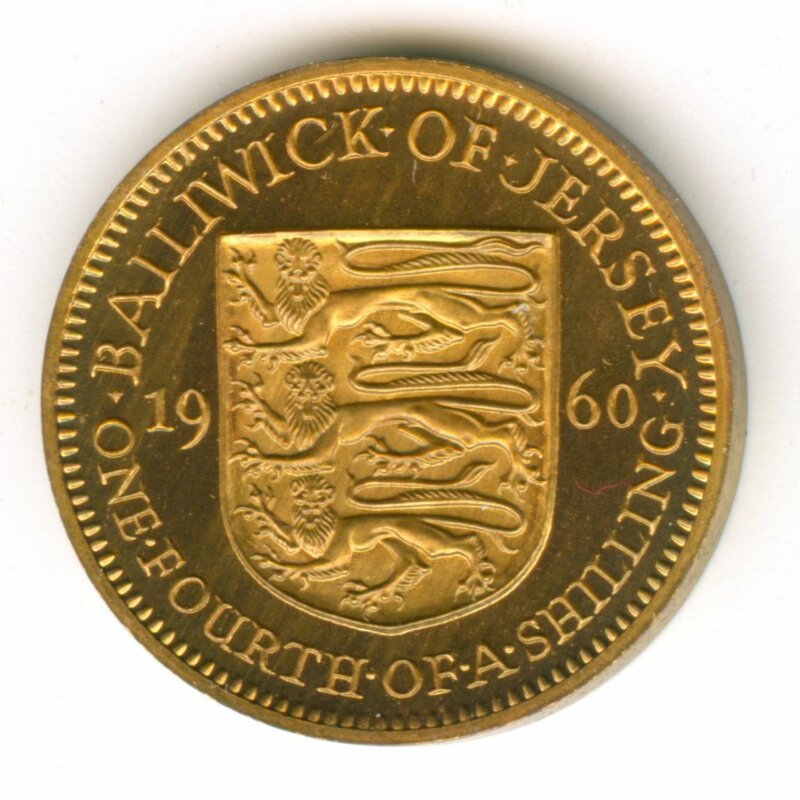 There are three known examples of a one penny UK 1966 reverse, muled with obverse of a Jersey penny. The Coinage Act of 1957 authorized the 1957 coinage. The Coinage Act of 1961 authorized the 1960 coinage. One fourth of a shilling coins were legal for a payment of an amount not exceeding two shillings. 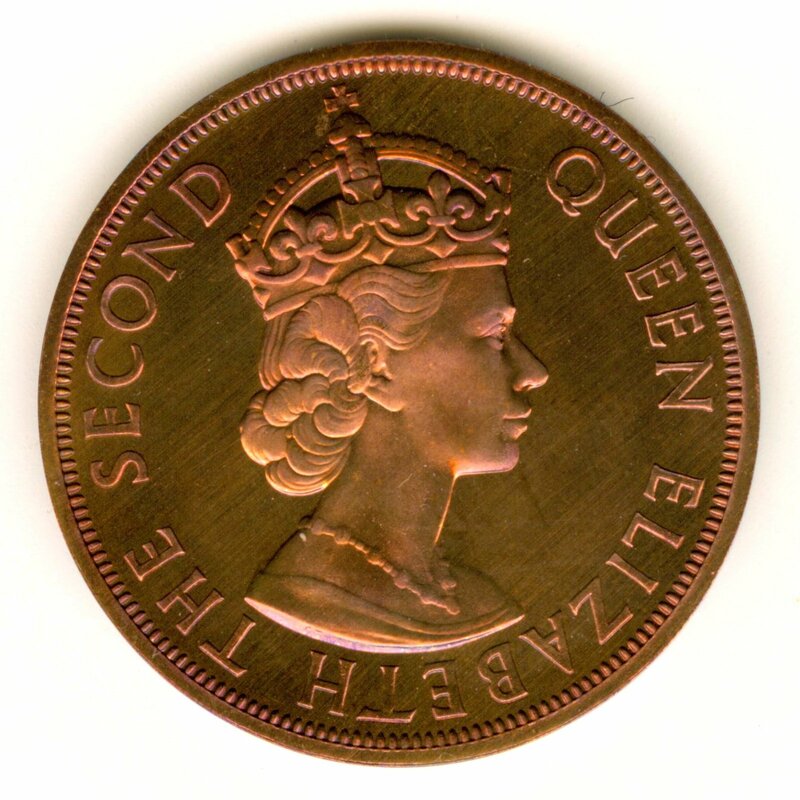 Similar to the 1960 penny, the total mintage for the proof coins is 3,6001. Most sources report a mintage of 4,200 for this proof only issue, and is incorrect. The Coinage Act of 1964 authorized this coinage. 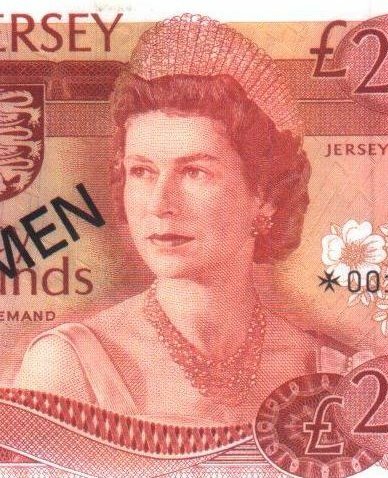 Jersey's second series of banknotes depicts this portrait of Her Majesty. This portrait of Her Majesty is adapted from a photograph taken prior to a Royal Tour of India and Pakistan. This is one of the more widely used images of The Queen. The Coinage Act of 1966 authorized this issue. Of the two designs, the Royal Mint adapted sketch “B” with the two modifications. 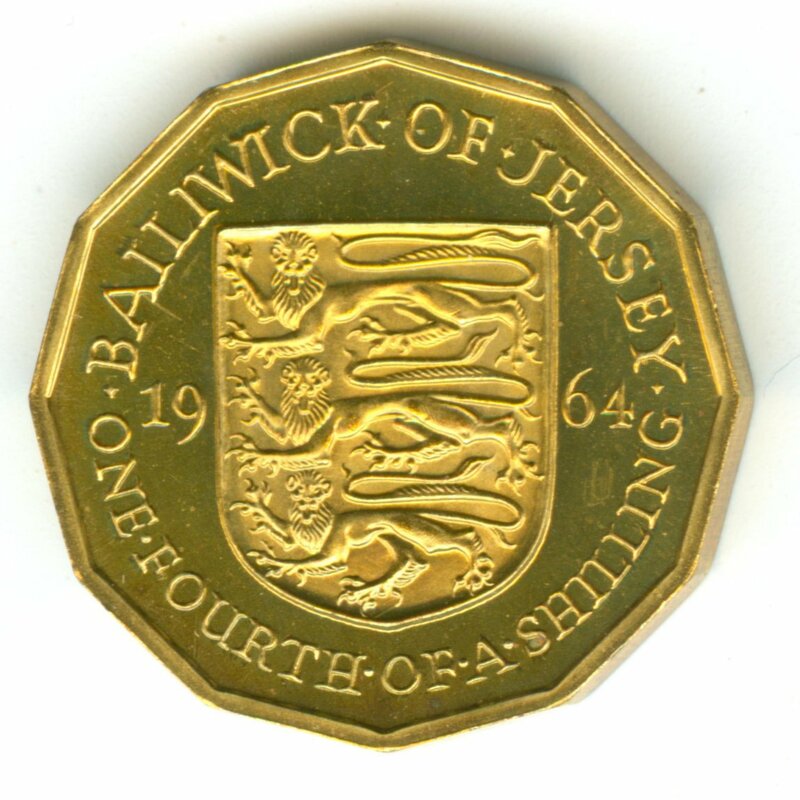 The first modification was to reverse the positions of “BAILIWICK OF JERSEY” and “FIVE SHILLINGS” so that the former was below the shield and the latter above it. The second modification was to slightly reduce the size of the lettering. The cost of a proof set to the States was 5/- for each coin and 3/6 for the case. Originally, the Mint quoted the States a price of 2/6d for each crown, however the States wanted a “Grade 4” coin versus a “Grade 3.” Per the Royal Mint documents, “It is essential that these proof coins should be acceptable in America and we are therefore agreeable to them being produced by the former method and are prepared to pay the extra price of 2/6d per coin.”2 In 1967 British dealers were selling the Jersey proof crown set for around £4. The cost of the general circulation issue was £40/10/0 per thousand. These coins were “going so well” that an additional 200,000 pieces were ordered on May 31, 1966. 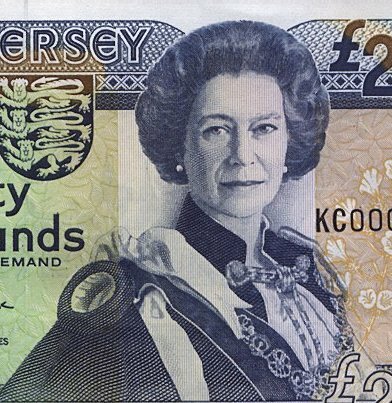 Jersey's third set of banknotes uses this portrait, which is copied from a painting by Norman Hepple. The portrait shows Her Majesty's attire in the regalia of the Order of the Garter and was commissioned by the States of Jersey. The original painting hangs in the entrance to the Jersey States Chamber in the States Building, St. Helier, Jersey. 1. MINT 20/4132, Jersey: error in manufacture of 1d coins in 1960 proof sets. 1968 Jan 01 - 1970 Dec 31. The Public Record Office, Kew, Richmond, Surrey, UK. 2. MINT 20/3031, Jersey: Crown pieces. 1964-1965. The Public Record Office, Kew, Richmond, Surrey, UK. 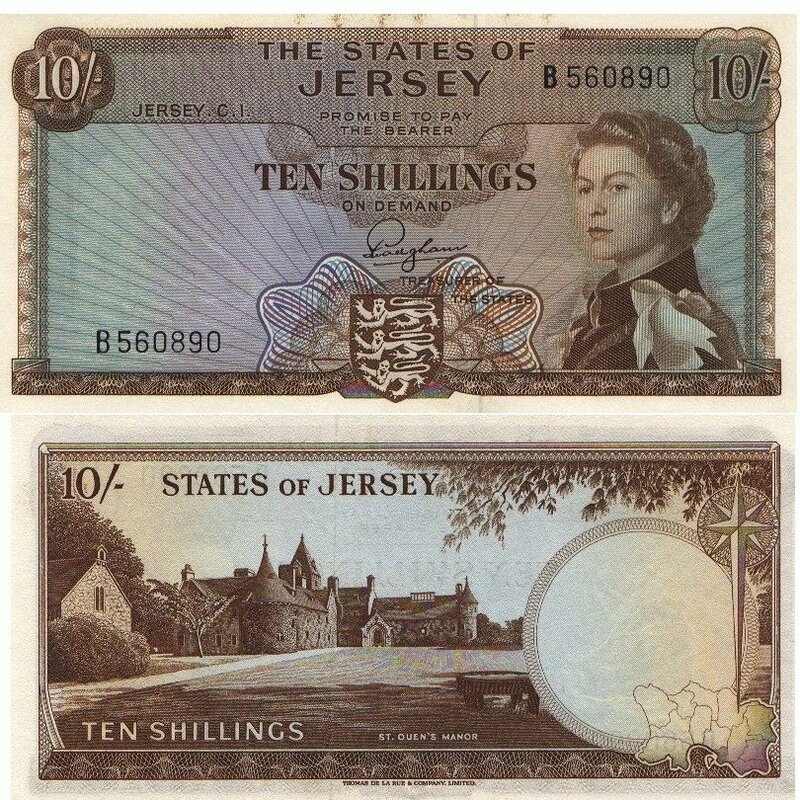 Starting in 1963 the States issued 10 shillings, one, five and ten pounds notes.